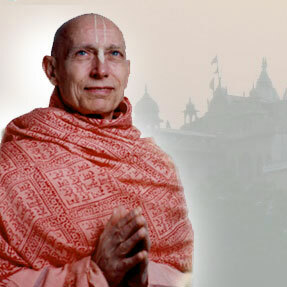 In 1976, wanting to deepen his realization of the Divine, he moved to West Los Angeles to study at the ISKCON temple various aspects of Bhakti yoga (the yoga of love and devotion to God) under the famous spiritual master A. C. Bhaktivedanta Swami Prabhupada. From this highly advanced teacher, Amal Bhakta was initiated into techniques that enabled him to attain and maintain inner peace, joy, and strength continuously, even under the most trying conditions. He also became an expert in explaining some of India’s ancient classics, such as the Bhagavad Gita and Mahabharata, with a view to helping people acquire virtue, wisdom, self-knowledge and God-realization. Amal Bhakta still resides near the same temple in Los Angeles, teaching, counseling, and lecturing regularly, but he also travels extensively to other states and countries, performing similar services. He has also written the four published books displayed on this website, and has produced, directed, and narrated hundreds of hours of audio books, both dramatic and non-dramatic, mostly written by his spiritual master, for Krishna Productions. Amal Bhakta’s books are about India’s divine incarnations and saints, and are designed to assist truth-seekers in viewing ideal devotees of God to model their lives around. Although he is over eighty years old, Amal Bhakta is highly energetic and rarely ill. He attributes this not only to genetic factors, but also to a lifestyle which consists of yoga postures and physical exercises, mostly raw foods, regular spiritual disciplines, and of course–the grace of his guru and God. His greatest pleasure is to help persons develop their faith in and love for God, which alone, he believes, can bring one lasting peace, continuous joy, and boundless happiness.